Over $350 in gift cards from Amazon, WalMart and Best Buy! What other EdCamp in the world can offer you prize opportunities like these? That’s right friends, only EdCampOKC! Come for the prizes, stay for the conversations and the learning. 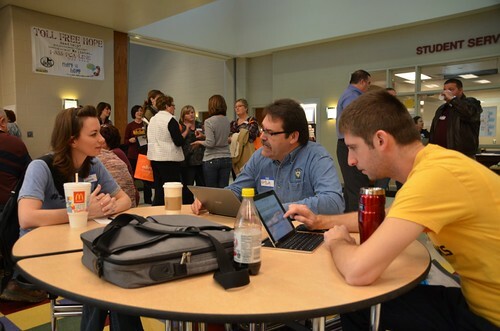 EdCampOKC is a FREE Saturday professional development event like no other! Many thanks to our 2017 sponsors who are making all these wonderful prizes available! Remember that the fun and the learning for EdCampOKC starts on Friday night at our pre-EdCamp tweetup / meetup! No you don’t have to be on Twitter to come, but we promise someone will talk to you about Twitter at some point during the evening! This year we’ll meetup at Buffalo Wild Wings from 7-9 pm (Friday, March 3) at the 5500 Tinker Diagonal, Del City, OK 73115 location. Want to start your EdCampOKC learning early on Saturday? We’ll have our 2nd annual CoffeeEDU starting at 7 am! Check out our full (and updated) schedule for more details about the day. Lunch this year will be an hour and a half, on your own, with lots of great restaurants near Del City High School. Come back by 12:45 for our first round of prize givaways! Remaining prizes will be given away at 3:30 following our fourth and final session of the day. You must be present to win a prize! We’ve got another fantastic tshirt design this year, and are again getting the “soft” tshirts you’ll want to wear to school every week! Please order a tshirt by February 26th. You’ll pay online, and pick up your tshirt the day of EdCampOKC. Finally, please help us spread the word by printing and sharing our marketing flyers at your school! Post these in your lounge, put one up by teacher mailboxes, and give them directly to teachers you know would enjoy and love the EdCamp experience! 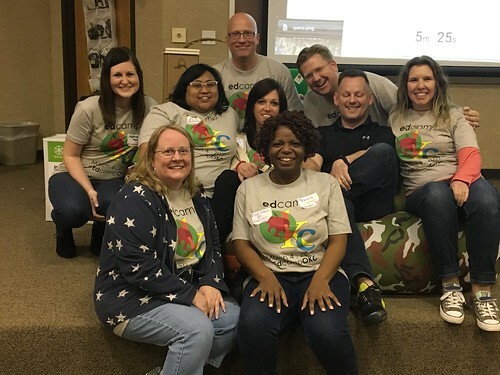 We rely on word-of-mouth, personal invitations – so help us out and invite several people to join you at EdCampOKC! Click below to download PDF versions of our TWO marketing flyers for this year. Thanks to Telannia Norfar (@thnorfar) for putting these together for us this year! The rumors are true, more Oklahoma EdCamp dreams will be coming true in the new year! 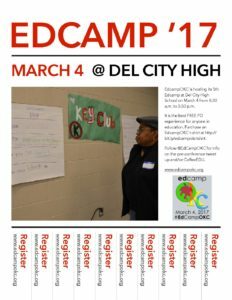 Your organizer team for EdCampOKC 2017 is excited to announce FREE registration is now LIVE and available online for our FIFTH Oklahoma City EdCamp coming Saturday, March 4, 2017, to Del City High School in MidDel Public Schools! Please help us spread the word far and wide! Also order an EdCampOKC 2017 tshirt for just $12! Tshirts will be available for pickup on March 4th. The last day to order is Sunday, February 26th. 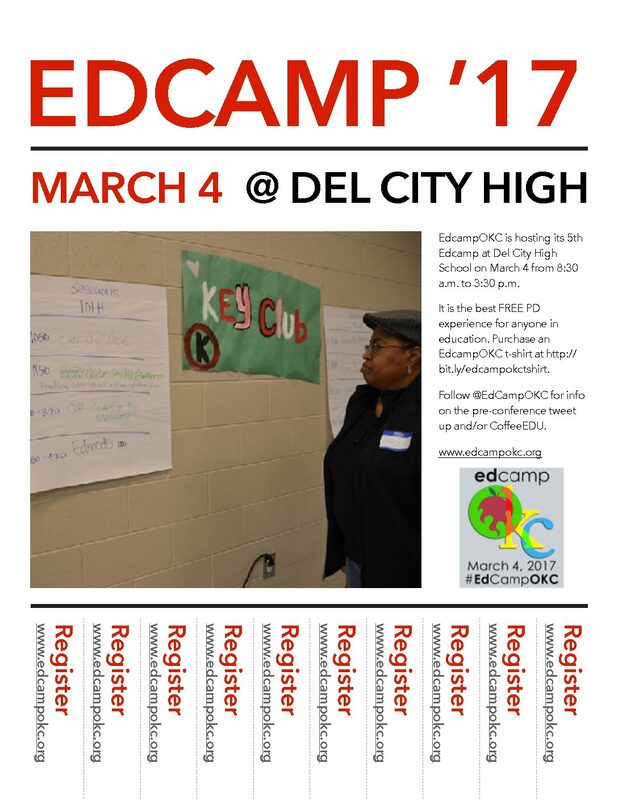 Mark your calendar and plan to join us for a fantastic day of self-directed, EdCamp learning on Saturday, March 4th! We had a great day of learning at EdCampOKC 2016! Check out the Storify of tweets shared throughout the day. There were almost 600! Thanks to everyone for participating and making it a great day of learning! All participants should receive an email with information about how to submit our 2016 evaluation form and obtain a professional development certificate as an email attachment. 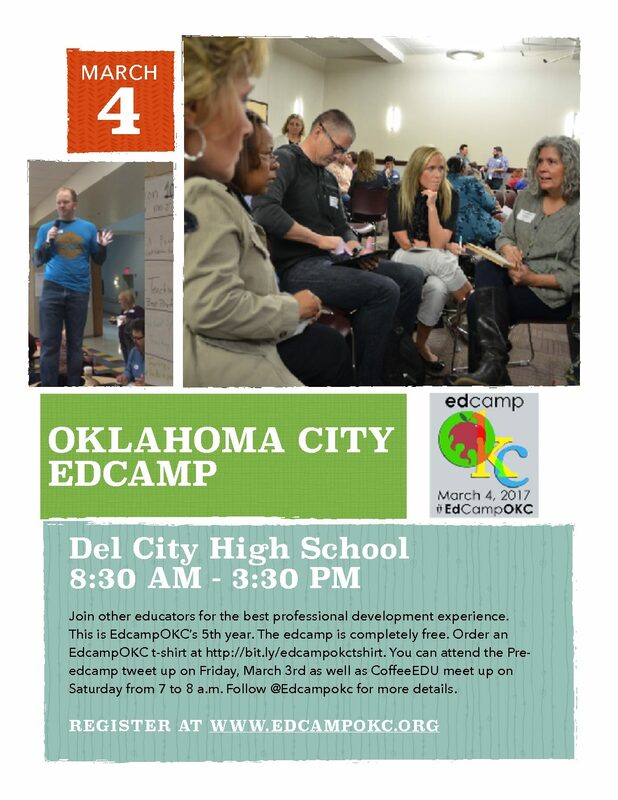 Make plans now to attend and bring a friend to the fourth annual EdCampOKC, coming up on Saturday, March 5, 2016 at John Marshall High School in Oklahoma City. Registration is FREE and the chances you’ll learn something new if you participate are GUARANTEED! 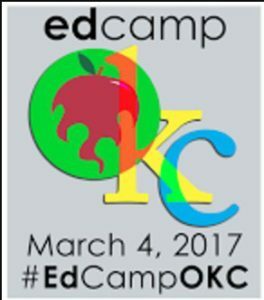 Register on edcampokc.eventbrite.com, and learn more about EdCamps by visiting our About page. 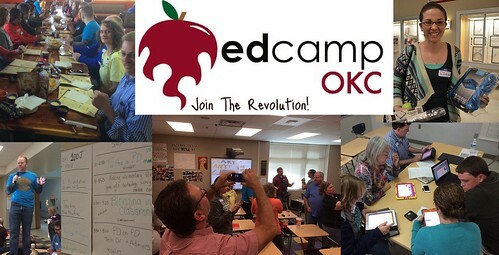 All upcoming Oklahoma EdCamps are listed on EdCampOK.org. Please mark your calendar and plan to attend the next EdCamp event in Oklahoma: EdCampOSKDE the afternoon of Tuesday, July 7th! This will be part of the Oklahoma State Department of Education’s 3 day EngageOK conference, held at the Cox Convention Center in downtown Oklahoma City. Registration for the entire conference is free via EventBrite. EdCampOSDE will start at 12:30 pm on July 7th. It will include an app smackdown and three sessions, along with a closing session for prizes. The final schedule should be shared and posted soon. Please use the Twitter hashtag #edcampOKSDE to share the event amplify your learning around it! All upcoming and past Oklahoma EdCamp & PLAYDATE professional development events are listed on www.edcampok.org. Our EdCampOKC organizer team had a Google Hangout this morning to help plan the event with SDE staff. We’re looking forward to seeing you at PLAYDATE on Saturday at John Rex Charter School in Oklahoma City! We have 31 currently registered so this should be a super group. We’ve posted updated information on both “our schedule” page and “what to bring and know” page. Definitely check out our event map! We are planning to have 3 primary sessions which will repeat during Playdate, but each Minecraft/MinecraftEDU session will have a different suggested focus. You are welcome to attend all three sessions or stay in 1 session all morning… whatever suits you! We have some students who are Minecraft gurus designated to help facilitate/coach the Minecraft sessions, but don’t have other designated facilitators. We do have at least 1 certified Code.org instructor coming, and at least 1 Hopscotch quasi-expert! Remember this is PLAYdate, we’re going to play together and learn lots! Here is some of the updated information from our website, copied here for your reference. Note on the map that we’ll be using meeting rooms upstairs on the THIRD FLOOR, look for the signs. Enter via the main entrance at Sheridan and Walker, parking is free on the streets adjacent to the school. We also recommend you setup a free account on studio.code.org. See you on Saturday! Please remember to charge your devices in advance! Would you like to learn more about free apps students can use at school and at home to learn basic computer programming? (These include HopScotch and Scratch Jr.) Would you like to learn more about Minecraft and MinecraftEDU, including ways these programs can be used by students to create simulations, learn problem solving, and practice collaboration skills? 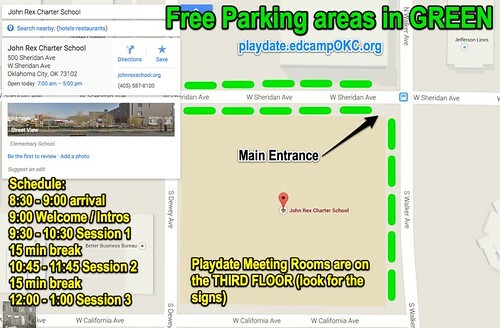 If so, please join other educators on Saturday, April 18th, 2015, at John Rex Elementary School in downtown Oklahoma City from 9 am to 1 pm for our third PLAYDATE PD event. FREE registration is available via EventBrite. Learn more about PLAYDATE by visiting playdate.edcampokc.org, and watching the video embedded below. If you have a school-age child interested in coding or Minecraft, register and bring them along too! PLAYDATE isn’t about listening to others present about topics, it’s about PLAYING with apps and software programs and learning more together. “Come join us in the digital sandbox” on Saturday, April 18th, and bring friends, colleagues, and family members along to play and learn together! Best of all, just like EdCampOKC, PLAYDATE is entirely FREE! Bring your tablet computers and laptop computers, we’ll have open wifi access and school licenses of Minecraft and MinecraftEDU you can install and use on your laptop if needed. If you can pre-install Minecraft and have your own license that is great too – and even better! Be sure you have/know the iTunes or Google Play Store password for your tablet so you can install free coding apps like HopScotch and Scratch Jr. if you don’t have them installed already. We expect this to be a MUCH smaller event than EdCamp. This is our third PLAYDATE in OKC, and previously we’ve had 15-20 people attend each one. We can accomodate up to 60 people, however, so if you have a big crew you want to invite that’s great – just please have them register in advance so we know how many to expect! 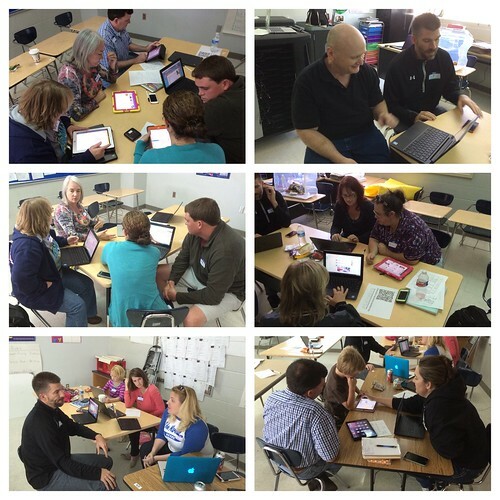 EdCampOKC 2015 was a great success on Saturday! Many thanks to our hosts, sponsors, organizers and participants who made it a fantastic day of learning. A Storify archive of 700+ tweets from the day is available, including many photos. Thanks for sharing and keep it up using the #OklaEd hashtag! Please help us thank our 2015 EdCampOKC sponsors! Use the ThingLink-powered image below to connect to, follow, and THANK our 2015 sponsors! Thanks to Adam Rogers (@MrRogersTech) and Tammy Parks (@tparks) for creating this interactive image!